You are here: Home / Employee Engagement / Filling Buckets: How Full is Your Bucket? Filling Buckets: How Full is Your Bucket? 3 Reviews and 1 interview. This is the last book review of three of Tom Rath’s books that can make a very significant contribution to employee engagement. 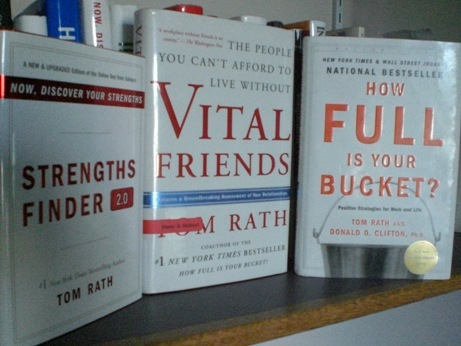 In conjunction with Donald O. Clifton, Tom wrote How Full is Your Bucket: Positive Strategies for Work and Life. The fourth, and final, post in this series will be an exclusive interview with Tom Rath about his work and the influence of his grandfather, Donald O. Clifton. Make a positive moment. The focus of the book is on how to accentuate, increase, and strengthen positive moments and that every moment matters. Disengagement costs at $1 trillion per year. We have up to 20,000 moments per day. How well do you use them to enhance and develop others? Making the most of moments with others can have a strong positive impace on engagement and the cost of disengagement in the United States is estimated at a possible $1 trillion per year! Quick stats. 9 out of 10 people say they are more productive when they’re around positive people yet even with school children in Canada up to 83% of parents focus more on their child’s F’s than A’s. I have praised someone in the past 24 hours. I have developed a knack for making other people feel good. I make a point to become acquainted with people wherever I go. I notice what my colleagues do at a level of excellence. Next article: An exclusive interview with Tom Rath. This sounds like a great book – I’ll have to check it out. Thanks!